I was especially looking forward to making this tart, since I had just sampled the original at Bouchon Bakery in Yountville. 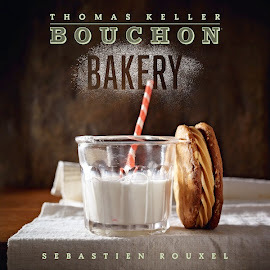 Since I knew this would be my next recipe, when visiting the Napa valley for wine tasting last Friday I made sure to stop at Bouchon to see what I would be up against. The tart was so pristine, served on a little gold disk. The crust was very firm, hard to cut through, but the lemon curd inside was divine! 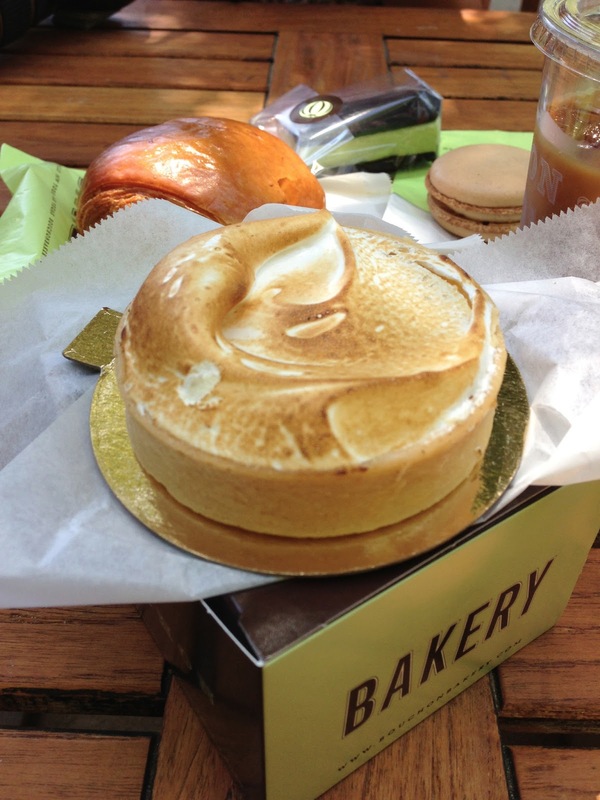 The meringue was torched to perfection. It was definitely inspiring, and a bit daunting. Could my tart live up to the gold standard? 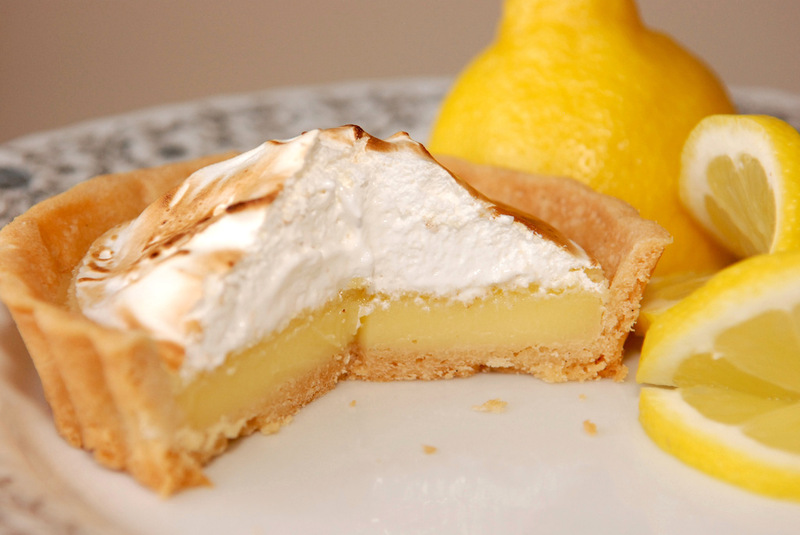 There are only four parts to this dessert: crust, lemon curd, lemon cake, and meringue. Easy, right? I had the pate sucrée already made and in the freezer. First I made the lemon madeleine cake, which we've made before. Then I made the lemon curd, which I've made some version of many times. This method was a bit different, but it turned out great! And the meringue, which I've also made before, but had to wait until the last minute to assemble. I couldn't find 3 inch tart molds, So I used 3.5 inch tins, half fluted, half straight. Blind baking them was tricky, and they weren't as clean and pristine as I would have liked. I layered the curd and the cake rounds in the shells, and then made the meringue. I used defrosted egg whites that I had in the freezer, and the meringue never got to stiff peaks. The book says to beat for about 5 minutes or stiff peaks. I beat for at least 10 minutes, and still no stiff peaks! So I piped on the meringue, and busted out the torch. Last time I used the torch, it went crazy and almost burned down the kitchen. But this time it was fine. I got a nice brown on the meringue and they looked great! After tasting the tarts, I could tell they weren't as good as the Bouchon version. My meringue wasn't dry enough, it was a little runny and sticky still, but tasty. The crud was delicious, the crust was crisp, and the cake was nice but a little weak in flavor. Overall, delicious, but I was disappointed they weren't as good as the original. Try, try again! I have been looking forward to this recipe. I am a visual person and fully believe you eat with your eyes and the photograph for this tart in the book is one of the most memorable for me, the way the residual smoke comes off the toasted meringue. It's beautiful. Aside from the visual aspect of it, the actual components are relatively easy. There is the crust, lemon curd and Swiss meringue - all standard components of the dessert but for the twist, there is a madeleine cake layer. I did goof slightly in making the whole madeleine cake when there were specific instructions to make a much smaller quantity for this particular recipe. (Thank you Amy for helping me figure it out). The nice thing is the cake can be frozen so I will keep it for another occasion. Second, I've never actually done lemon curd directly in the pan before. I've always used the double boiler method to prevent the eggs from cooking which is what happened when I stopped stirring briefly. It wasn't a big deal because I just strained them out. This recipe had a lot of piece parts (don't they all? ), but none was hard and I made everything except the meringue ahead of time. Today, all I had to do was make the meringue and fill the tarts - which took less than an hour to complete. - Eggs: instead of straining them, I beat them with an immersion blender. This technique seems to accomplish the same result as straining, but I find it quicker and less messy. It's a trick I learned from "Sarabeth's Bakery" cookbook. - Butter/glucose mixture for the madeleine cake: I think it's important that the mixture still be warm (not hot, but not room temperature, either) when you start adding the egg mixture to it. - Pate sucree: next time I will divide the 1/2 recipe into six pieces and roll out six small rounds, one for each tart pan, rather than one large round. I found it helpful to chill the rolled-out dough, and this way I can work with one round at a time and keep the others cold. Also, I used dried beans rather than rice when I blind baked them and it worked fine. - Meringue: I put 40 grams of meringue on each tart. That's double the amount specified, yet I still had some left over. I can see why Thomas and Sebastien would say that's too much meringue, but my meringue-loving husband was happy. Conclusion: I loved these tarts, and I'll make them again - maybe even for a dinner party, since they take less than an hour to finish up. The lemon curd was perfect - a creamy balance of tart and sweet. The thin layer of cake was unusual, and you can't really tell it's there. But I think it probably adds to the texture, and it also helps to hold the meringue in place. A winning recipe! While Bouchon’s recipes may not always be simple, the result is always well worth the effort. These lemon meringue tarts turned out perfect. I would not have changed a single thing! The tart crust was sweet and crunchy and filled with a silky, smooth lemon curd. Next, a very thin round of madeleine cake was placed on top of the curd. This cake is used to absorb any liquid from the meringue as well as provide another layer of surprise texture to the tart. 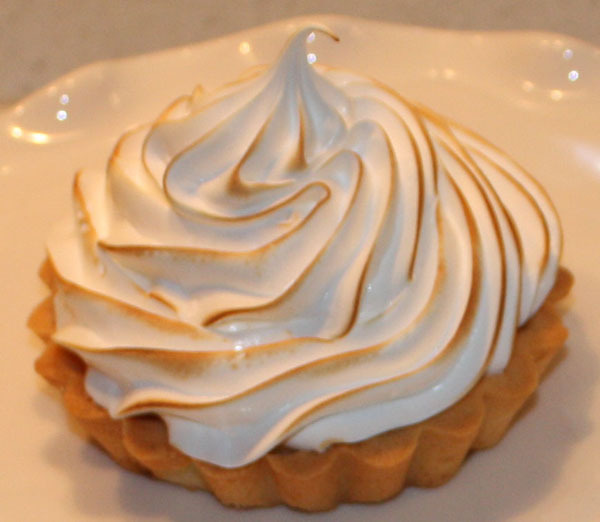 Swiss meringue is then piped on top of the tarts and torched until browned – amazing! I love lemon desserts (and lemon raspberry) more than any other dessert in the world. I basically bought this cookbook for this recipe. So to say my expectations were high is an understatement. However, I feel underwhelmed and I didn't fall in love. Each component was easy enough, but the whole thing was somewhat time consuming due to the addition of madeleine cake. Luckily, there were no odd ingredients, except gelatin sheets which I ordered off of amazon. I had the pate sucree frozen so I didn't have to make that. The meringue is basic and easy peasy. The curd takes no time. The hardest part(not hard per se, just the hardest part of this recipe) was the cake component. I don't really understand the point of the cake. I understand it is supposed to help with weeping meringue, but I've never really had that big of an issue with meringue. I would totally forego that part of the recipe next time. It adds no dimension...to me anyway, but adds extra time and dishes.